Research on the soil microbiome requires scientists to get their hands dirty. Over the course of five years, 58.000 soil samples were collected from 1450 sites all over the world (40 subsamples per site), that were carefully selected to be unaffected by human activities such as agriculture. First authors Mohamad Bahram (University of Tartu) and Falk Hildebrand (EMBL), together with a large team of collaborators, set up this massive project, gathered samples, and analysed the 14.2 terabyte dataset. Of the 1450 sites sampled, 189 were selected for in-depth analysis (see Figure 1), covering the world's most important biomes, from tropical forests to tundra, on all continents. Only half a percent of the millions of genes found in this study overlapped with existing data from gut and ocean microbiomes. "The amount of unknown genes is overwhelming, but the ones we can interpret clearly point to a global war between bacteria and fungi in soil," says Peer Bork, EMBL group leader and corresponding author of the paper. Overall, the bacterial diversity in soil is lower if there are relatively more fungi. The team also found a strong link between the number of antibiotic resistance genes in bacteria and the amount of fungi, especially those with potential for antibiotics production such as Penicillium. Falk Hildebrand: "This pattern could well be explained by the fact that fungi produce antibiotics in warfare with bacteria, and only bacteria with adequate antibiotic resistance genes can survive this." "The antagonism between fungi and bacteria influences the overall diversity of bacterial communities and determines their genetic repertoire of antibiotic resistance", says Mohamad Bahram. This information can be used to predict the spread of genes that lead to antibiotic resistance in different ecosystems, and via what routes they may reach human pathogens. It could also help predict and pinpoint locations with high levels of natural antibiotics producers. When comparing data from the unspoiled soil sites with data from locations affected by humans, such as farmland or garden lawns, the ratios between bacteria, fungi and antibiotics were completely different. 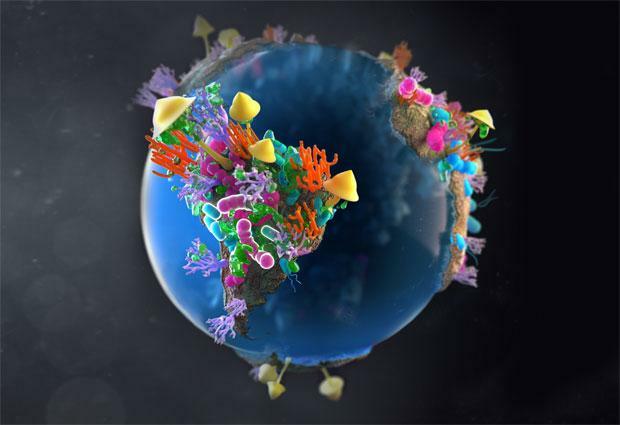 According to the scientists, this shift in the natural balance – that probably evolved over most of the earth's history – shows the effect of human activities on the soil microbiome, with unknown consequences so far. However, a better understanding of the interactions between fungi and bacteria in soil could help to reduce the usage of soil fertilizer in agriculture, as one could give beneficial microorganisms a better chance at survival in their natural environment.